Chewy Ginger Cookies with Lemon Cream Cheese Frosting are a delightful Christmas cookie from Oh Sweet Day! A Celebration Cookbook! 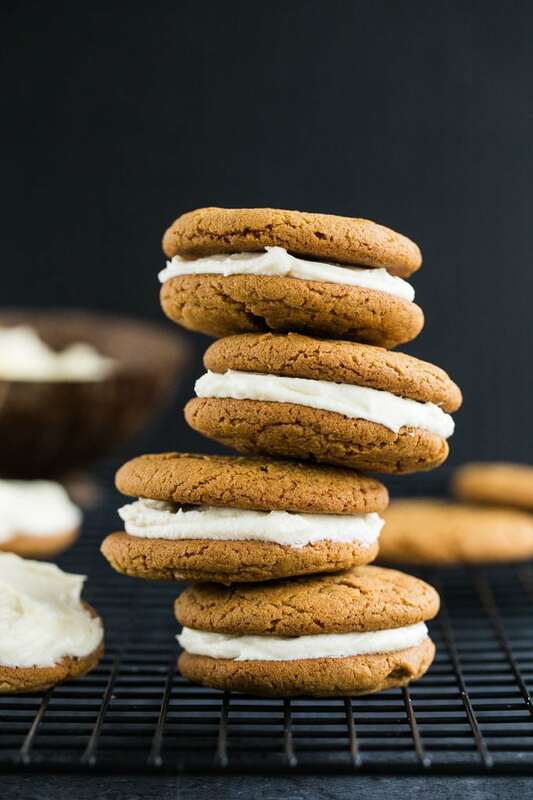 With a lemon cream cheese middle, these chewy ginger sandwich cookies are decadent but not overly sweet, and they go perfectly with a cup of tea or a mug of hot chocolate! *I’m sharing this recipe as part of my review of Oh Sweet Day! A Celebration Cookbook. I received a complimentary review copy of the cookbook from the author, Fanny Lam. All opinions are my own. Happy November! I know, it’s a day after Halloween and I’m already sharing a Christmas cookie recipe. But what can I say? It’s less than eight weeks until Christmas, and I have so many recipes I want to share with you guys, so I can’t waste any time. And what better way to kick off the Christmas cookie season than with a ginger cookie?! But not just a ginger cookie, a chewy ginger sandwich cookie! 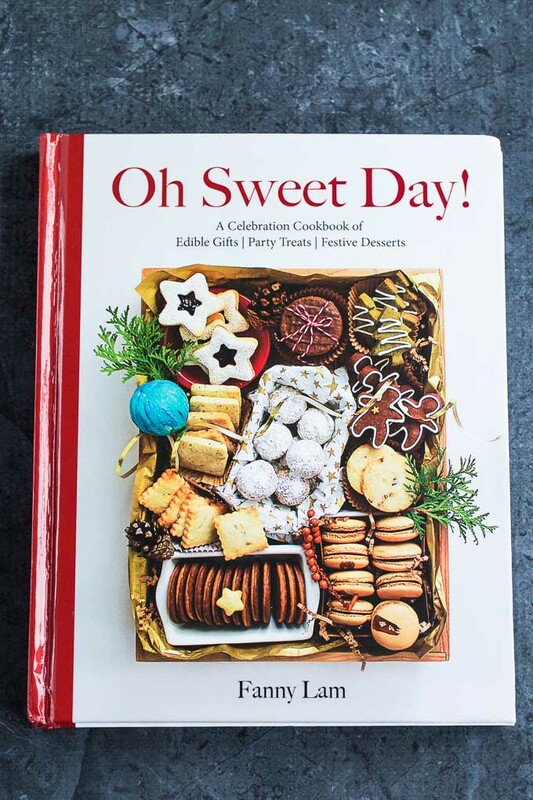 If you like variety, lovely food photos and holiday recipes that can be made any time of the year, you should probably add this cookbook to your list! 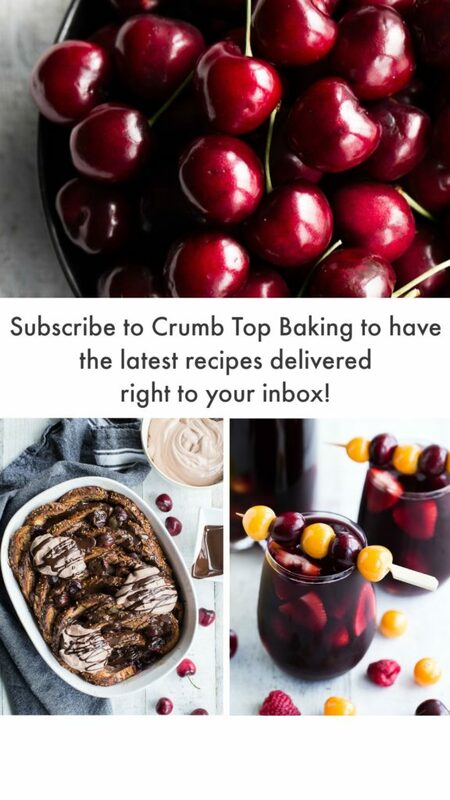 If you’re a long-time reader of Crumb Top Baking, you already know how much I love baking, and gearing up for the Christmas baking season is simply the best time of year. Some weekend soon I will spend an entire Saturday morning drinking endless cups of coffee while sifting through the pages of dozens of cookbooks. By the time the morning ends, I will have a list as long as my arm of all the Christmas cookies and desserts I want to make. While my list will include plenty of clean eating treats, I always enjoy making some decadent treats for the holidays. Life is all about balance, and I always make sure to strike that balance around Christmas. 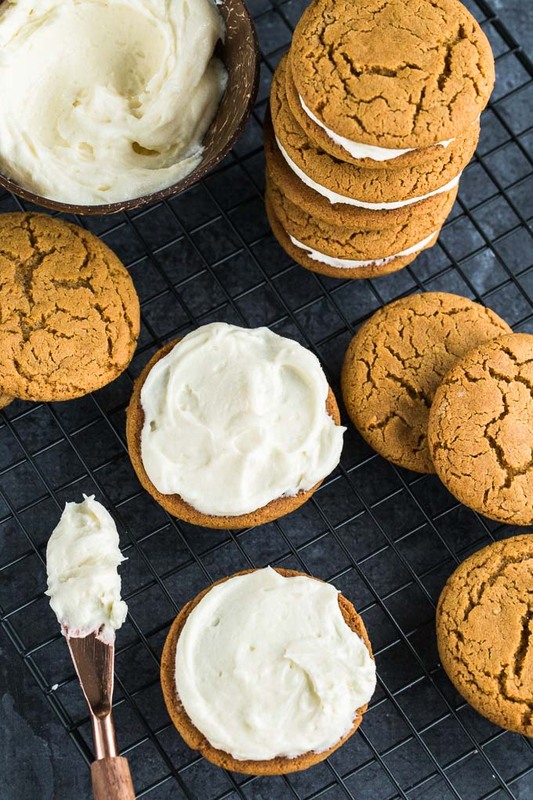 And if you haven’t guessed yet, these Chewy Ginger Cookies with Lemon Cream Cheese Frosting are one of the decadent treats on my list this year. They’re not overly sweet, and with the warm spices and chewy texture, they’re sure to be a hit with the cookie lovers in your life. To make sandwich cookies, you need flat cookies. To ensure your cookies turn out flat and chewy, make sure you beat the butter and sugar until light and fluffy. The first time I made these, I didn’t beat them together long enough and the cookies didn’t flatten out. 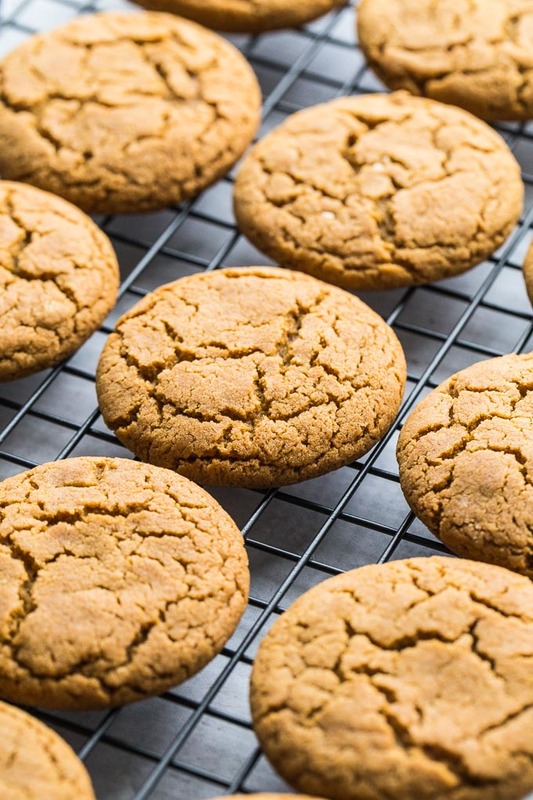 The chewy ginger cookies are an awesome treat on their own. So if you aren’t a big fan of cream cheese frostings, you can forego the sandwich cookies and enjoy the single layers. These are great to make ahead for the holidays. You can freeze the sandwiches and defrost when ready to enjoy. Or you can just freeze the cookies and when ready to enjoy, defrost and add the frosting before serving. If you make these Chewy Ginger Cookies with Lemon Cream Cheese Frosting or purchase Oh Sweet Day! A Celebration Cookbook, I would love to hear what you think in the comments below. Credit: Recipe from Oh Sweet Day! A Celebration Cookbook, reprinted by permission of Front Table Book, an imprint of Cedar Fort, Inc.
Pre-heat the oven to 325F and line two large baking sheets with parchment paper. 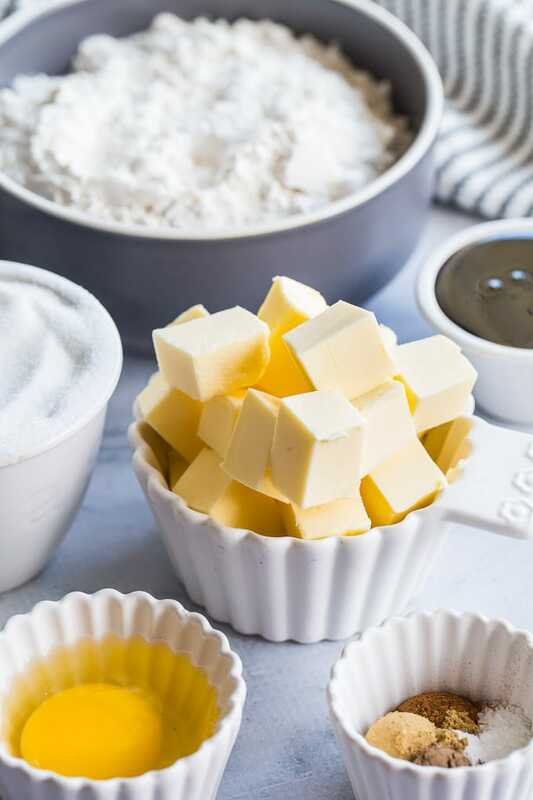 In a large bowl, combine the butter and sugar and beat with an electric mixer on medium speed until light and fluffy. About 5 minutes. In a small bowl, sift together the flour, baking soda, salt and spices. With the mixer on low speed, gradually add the dry ingredients to the wet ingredients and mix until just combined. 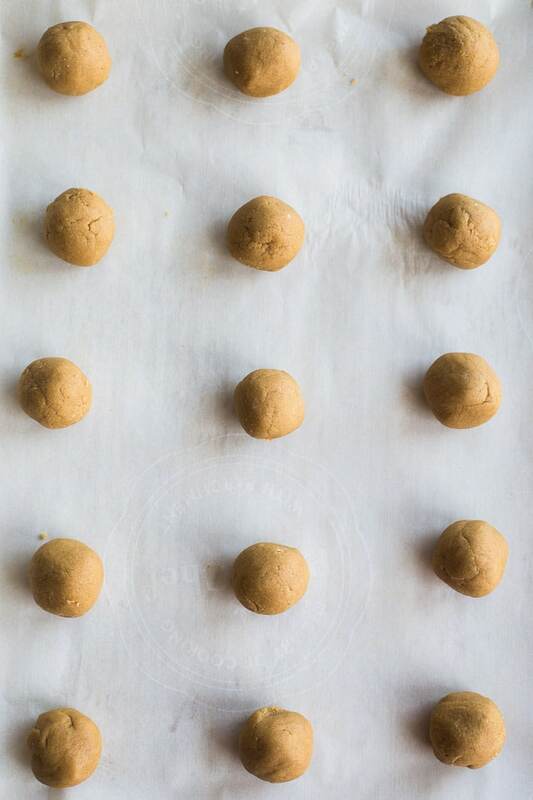 Roll the dough into tablespoon-sized balls and arrange on the baking sheets about two inches a part. Bake for 12-15 minutes. Depending on the size of your pans, you will likely need to bake the cookies in two batches. Let the cookies cool on the pans for a few minutes before transferring to a wire rack to cool completely. In a medium-sized bowl, add the cream cheese, butter and lemon juice and using an electric mixer, beat on medium speed until creamy. About 2 minutes. Add the powdered sugar and beat on low speed until combined. Then increase the speed to medium and beat until light and fluffy. About 5 minutes. Using a knife, spread the frosting on the bottom side of 18 of the cookies. Top with the other 18 cookies to make sandwiches. Store in an airtight container in the fridge and enjoy within 4-5 days, or freeze for later enjoyment. To ensure your cookies turn out flat and chewy, make sure you beat the butter and sugar until light and fluffy. This will really take about 5 minutes. Be sure to space out the dough balls at least 2 inches apart before baking. The cookies will spread out and flatten, so they need the extra space. Thanks Kelsie! I just can’t resist a good cookbook, but there’s always room for one more! These cookies are pretty addictive, and I had no idea ginger and lemon could go so well together! Sounds like a great cookbook, Leanne! And these cookies sound marvelous with the ginger and lemon combo. Though you can eat the cookies as they are without frosting, I think that frosting is required….’cause holidays 😉 Hope you’re having a great week! Thanks Dawn! These cookies were seriously great with and without the frosting. But agreed, when it’s the holidays, always go with the frosting! Hope you had a lovely weekend! Thanks Leanne for the cookbook information…everything looks great as usual! Thanks so much Barb! Hope your week is off to a great start! Eeeeek I love ginger cookies SO much. This is such a delicious pairing!! I would have to give them all away so I don’t eat them all in one sitting. Have a great weekend, Leanne! Haha! Thanks Katherine! That’s definitely why I tend to freeze Christmas cookies. Makes them a little less accessible! Hope you had a lovely weekend! Thanks Patrick! Hope you had a great weekend too! Fanny’s cookbook is fantastic Leanne! I’ll be sharing a recipe too. 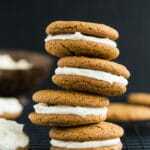 And these chewy ginger sandwich cookies will be next on my baking list! Delicious!! Thanks Mary Ann! It’s a great cookbook. Can’t wait to see which recipe you’ll be sharing! Thanks Marissa! It’s definitely a cookbook worth checking out. And I always love photographing a cookie stack! It’s a fun challenge! Have a great week! I need to make these! Reminds me of when I was a kid. Thanks Terri! They remind me of my childhood too. Would love to know what you think if you make them! Lemon and ginger are a great combo! If you like Christmas cookbooks, this one doesn’t disappoint. Thanks for stopping by Heather! Thanks Ashika! I had no idea lemon and ginger made such a great combo. I’m glad I tried these cookies! Ginger cookies are one of my favorite holiday treats! I love the combination of gingerbread with citrus and cream cheese so these sandwich cookies are calling my name! Thanks Marcie! I made these a few times in preparation for this post, and they were a big hit in my house. I’ll definitely be making them again for the holidays! YUM! 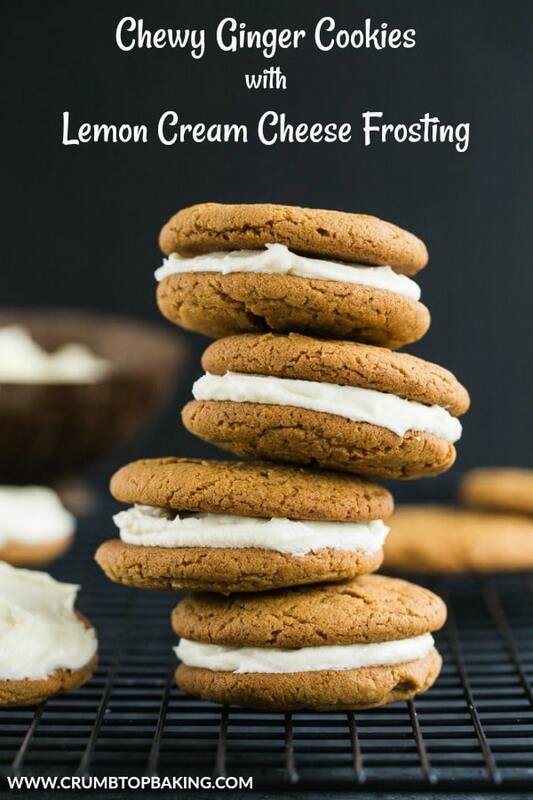 Ginger with the lemon cream cheese sounds amazing! A perfect combination!! Pinned! Thanks Annie! I had no idea ginger and lemon could make such a great combo! Thanks for pinning! My mind has switched to Christmas ideas as well, and although I’m not sharing any for a few weeks, I have already got some photos for my future posts. Besides, I don’t mind gingerbread all year round. These cookies look phenomenally delicious (perfect texture too), and the cream cheese frosting? Yes please! Thanks Ben! I’m probably getting a little carried away with the Christmas recipes this year! Can’t wait to see what you’ll be sharing! Thanks for creating such a lovely cookbook! I’m looking forward to making many more recipes!